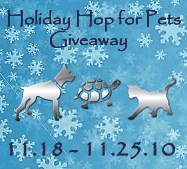 Welcome to the Holiday Giveaway Hop for Pets! Thanks for joining us! The Giveaway will run from 12:01 am EST on Thursday November 18th to 11:59pm EST Thursday November 25th (Thanksgiving!). Once you have entered our giveaway on afFURmation be sure to visit the other blogs in the hop. I love soft pet carriers! After using plastic carriers for so long, my arms and back could not believe the difference when I finally got one. To share the joy, I’m am giving away a Celltei Pak-o-Pet. Celltei – The Design House for Pets is a company that offers pet carriers for so many different lifestyles and pets- from on-the-go to want to look fashionable, from dog to parrot. Check out their selection at Celltei. The Celltei Pak-o-Pet in the giveaway is Dark Grey nylon and size small which is made to comfortably fit pets of about 6lbs. So how do you enter? (Sorry, the giveaway is open to US addresses only). Would you like to earn additional entries? Do any or all of the following and leave a comment letting me know which additional entry you did (leave a separate comment for each entry). You can earn 1 additional entry for each one. afFURmation is having a Celltei Pak-o-Pet giveaway. Stop by http://affurmation.com to enter. 2 Follow afFURmation on Google Friend Connect. 3. Subscribe to my blog feed (You can subscribe by clicking on the RSS link that says POSTS in the upper right corner of this page.). I’ll be choosing the winner from all the entry comments on November 26th through random.org . I’ll email the winner to get their shipping information. Disclaimer: I received the Celltei Pak-o-Pet for free from a supervisor when I worked for an online pet retailer. I did not receive it from the manufacturer. It has never been used and was even in the original plastic until I took it out to take pictures. Check out these great blogs for more pet-related giveaways! Congratulations to the winner #58 hj! Thank you everyone who entered. There is talk of another Blog Hop Giveaway so keep watch. This is a little small for me! But it would be excellant to have for some of my smaller foster siblings! Well, my current dog bag is great, but too small. I manage to fit quite a bit in there, but it’s almost literally bursting at the seams! This carrier is perfect for Mack! I am probably too big. We don’t have anything like it! We are following you on Google Friends Connect! We are following you on Twitter as Coopermom71. We would love to win this to transport our cats! Hi! I would love to win because my littlest yorkie and my only girl, Roxie, is getting older now. She will be 11 on Christmas Eve, she loves going everywhere with me and the soft carrier would make her so much more comfortable! This would be perfect for my cats. We would love to have this bag so we can travel by plane to visit my family in Mexico! We would like it to keep cats safe in the car and so they can safely travel more places with the rest of the family. Joined GFC but don’t see RSS subscribe icon! We’d love it for foster kitties, they would fit just perfectly! This would be great for taking our little kitten out to the vet. I think I would like this carrier because I could use it for Ivan the blue russian cat that belongs to my boyfriend – we would love this because Ivan has to go to the groomers every 6 weeks and he FREAKS in the plastic carrier that he has so this softer nicer carrier might actually make him relax on the car ride there. I would love to use this soft sided carrier for my gigantic cat Mr. Phelix. Phelix is about 20 pounds now and super heavy! Taking him to the vet is not a fun task. This looks like it would be easier to carry than my clunky hard carrier. Looks more comfortable for my pet too. I would love to have this because it would be perfect to travel with when I visit my family 10hours away. I would love this as it would be much easier to carry than our plastic one and it would also be so much easier to store! Celltei Pak-o-Pet would make toting Kiko around much easier. I NEED this! Right now, our “carrier” is a cardboard box with lots of holes. We’ve already had an escape and it wasn’t pretty! I have the scratch marks to prove it. this would be perfect for my puppy banky to stay warm this winter. thanks for the opportunity to win. This carrier would be perfect for us because we don’t have a carrier at all, so our Yorkie doesn’t get to go places with us. This would be a perfect gift for my friend who has a chihuahua. I would love this carrier cause it looks like a smooth ride and I’d look chill with the ladies at the Vet. This would be great because I forgot our carrier at the airport and Rosie our Dachshund has nothing now.Thanks for the chance. We have 3 cats and one is MUCH smaller than the other 2, and he’s really too small for our normal plastic boxy carrier. I’m sure he would really prefer something like this which is more his size. thanks for the chance! We have a kitty, Michael, who we’d like to take places, but don’t have a carrier yet. My little chihuahua would fit in this perfectly. It’d be great for travel. This would be great for our dog Ginger bug-chihuahua. It would be alot easier to take her to grandma’s house. Thanks! This would be perfect for our little kitten when she gets to go for a ride. much more comfy than the bigger ones for her! I have 8 cats and especially for the older ones and the more skittish ones this kind of carier is much better. This would be perfect for my 2 pet rabbits. They are bonded, so they have to go every where together – even to the vet! If one needs a check up the other one goes along for a ride too. They hate their hardsided carrier, but I bet they would love this one! We have a poodle who we take with us all the time! This would be great for him as he’s alittle too big for a purse. My cat Gigi will be thrilled with this. She hates the ugly hard carrier I have. Thanks for the contest. Luv to have a new carrier that is so well suited to my pet. My old one is kind of rusty and cardboardy and yukky. Luckily we do not have to use it often. My Barkley gets a little shaky in the car so this cozy, waterproofed carrier would be perfect for him. Great hop giveaway, thanks! I have 9 cats and can never have too many carriers! plus I have major back problems, so a soft carrier would be easier to carry than a vari-kennel. I would love to win this because my dog hates going to the vet and this would be perfect to carry him in. Congrats to the winner! You’ll be receiving an email from me shortly!